Posted on September 3, 2013 by Veena S.
I met Anwar Habib at the tea shop inside Monda market in Hyderabad. Hesitantly, I stood at a distance observing him. I had risen early and by 7 am I was at the market, ready to capture the market scenes and maybe engage the vendors in conversations. Established more than 100 years ago, Monda market is the biggest fresh produce market in twin cities of Secunderabad and Hyderabad. The rail and bus stations are in proximity, providing transport. Anwar was busy boiling large amounts of milky tea or chai using an aluminium kettle. With deft manipulation of his hands, the kettle rose off the gas stove, into the swing of his arms to pour frothy cups of tea or chai into plastic cups. The chai would provide instant energy to the waiting vendors. ‘Aapko chai hona?’ Do you want tea? Habib asked me in typical Hyderabadi Hindi admonishing an awkward smile at me. ‘Jaroor, yes’ I replied, though unsure of the quality and hygiene here. ‘Doo cup ka kitna ? I said handing him Rs.20. ‘One for me and the other for the cauliflower vendor’. That conversation was enough to break the ice and Anwar began telling me his story. In return, I told him my intentions of buying vegetables and capturing photos. Its trading time. Two cups chai for photos. The wooden bench created a perfect spot. Seventeen years ago, as a young boy, every morning, Anwar accompanied his father to this market. He would sit alongside friendly vendors and watch the human interactions. His father, a coolie, carried jute sacks on his back from arriving trucks to sorting bays. The family survived on meagre wages, and he hardly attended school, remarked Anwar. Few years later, he began running as an errand boy earning his own pocket-money. Today, he beams with pride and enthusiasm, as a stall owner! 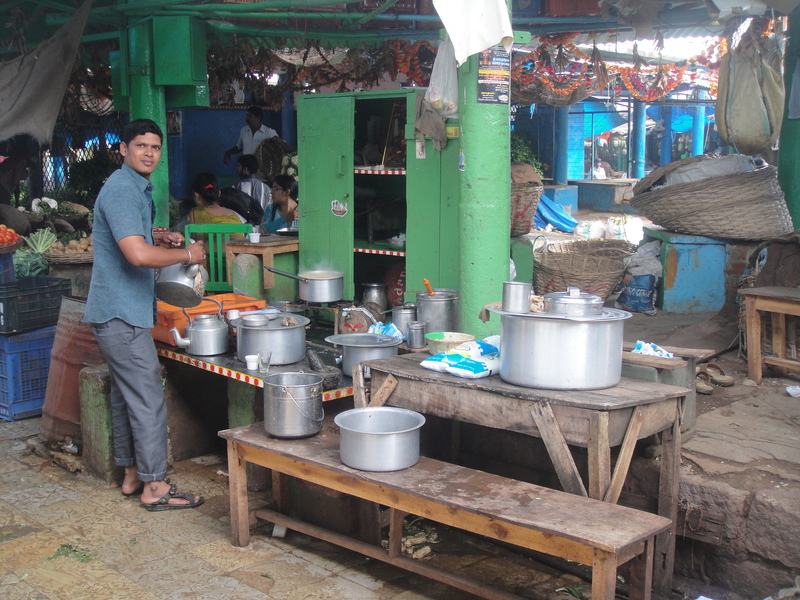 ‘It’s a dream come true – to serve the market community and be near his old uncle vendors.’ A better life than a coolie! Taking the other cup of tea I approached the woman vendor who sat nearby chopping off leaves from fresh white cauliflowers. Clad in purple sari and colourful bangles on her wrists, this Telugu Hindu vendor sported the traditional bright red bottu mark on her forehead. Both Hindus and Muslims make up the population of Hyderabad. The city was once ruled by Nizams and later the British set up their cantonment here. Shyly, Amma sipped the tea I offered and smiled at my camera. ‘This vegetable no Hyderabad Amma, special Dili’ she spoke practising her limited English. That explained the unusal price at Rs. 80 /per kilo! Local favourites I know are lady fingers, brinjals, flat beans and gourds raw bananas and chillies. Next stop was at the variety of cucumbers, in all colours and sizes. Long green ones are called kira, shorter are dondakaya, the ever popular, round -yellow are dosakaya, and the snake length ones are called potlakaya. Andhra food is hot and spicy, laced with plenty of poppu, a tempering of mustard seeds, curry leaf, asatoefida and turmeric. Most of the kira are chopped finely and curried into tangy, spicy chutneys that accompany mounds of hot rice. Ym..mm. I muttered at the thought of chutney! The main market building has low rise covered platforms. It has weathered many years of trade amidst surging crowds. The market was created to cater to the British and Indian army staff over 50 years ago. Today, it lacks basic amenities and insufficient parking for transport. The narrow lanes between the main building and landing bays now teem with haphazard growth of the vendors. Colourful plastic flower decorations that hang from some pillars, cleverly camouflage loose hanging electricity wires. But life goes on….from 5 am to 2 pm. People have little time to waste as they get busy buying, sorting, cleaning and rearranging their tiny spot with the fresh vegetables. They then await their ‘first boni’ or ‘lucky’ customer. Trudging delicately between shoddy stalls, upside down cartons of vegetables, wet slippery floors and human traffic, I squeezed my way to the other end. A large gold –gilded statue, probably a political leader, stood on the pavement, staring down at the people, as if a constant reminder of empty promises for cleaner, better facilities. for few photos. Amma, pointed to her grand children busy playing with stones in the other corner, they came only on weekends to help. On other days they attend school, striving for a better slice of life. ‘Wash and dry the Gongura leaves and then fry in spoon of oil. Add lot of garlic and red chillies to the Gongura.’ That, she said was her recipe to cure any mild cold and fever. Such simple, no fuss, instant recipe sharing. Green and red chillies are a vital part of Andhra cooking. The central plateau of Andhra is reputed for pungent red chillies, a visual treat as they dry out on roofs and verandahs during summer. I took a minute to capture these two women in action – one negotiating the price and the other sorting freshly arrived chilli using a woven, traditional bamboo sieve. When tossed in the air lightly, the chillies are separated from the fragments and dirt. It’s also used effectively to clean rice paddy, grains and nuts. Today traditional sieves are woven and coloured in contemporary style to adorn kitchens. Returning to the chai wallah or tea man to say goodbye, his friendly nature points me to the flower wallah at the entrance of the market, beyond the fruit vendors and spice shops, that have their own history. As the festive season of Dussera puja arrives, price of flowers shoot up. A basket of bright orange marigolds that usually sell for Rupees. 400 will now cost the vendor Rs. 600 or Rs. 700. Flowers arrive from neighbouring states of Coorg and Mysore, from the cool hill stations. ‘Beautiful garlands for your hair, Miss, and you can offer them at puja’ shouts Yelliah, the flower wallah. Holding up fragrant, white jasmine malai, neatly plaited strands, he beckons me. These flowers arrive from neighbouring states tied in tender green banana leaves to retain freshness. Once the leafy packets are opened, fragrance bursts and fills the morning air, purifying it of all the staleness and pollution present on the streets. Surely, the pretty white garlands dotted with red rose buds would make a perfect decor at the puja altar. Time, language, caste and creed of people is no barrier for trade and business at this market. Just buying 2 cups of chai, opened up conversations with the vendors, and I became wiser about their life and work, their woes and miseries of long, hard-working hours and their dreams for a better life for their next generation. Photo taking turned them into instant ‘ heroes’ this morning, providing brief respite from their mundane work, bringing smiles on their dry faces. What can I say about learning from interactions at this market ? Work hard, be dedicated to your profession, create better opportunities and transform yourself . Just like Anwar, from a back-breaking coolie to Tea stall holder. And his next generation will pour cups of chai …next time at the office desk ?